The USMNT's Sunday 2-2 tie with Portugal has been dubbed all of the above. After all, ties are un-American, and when you're 35 seconds away from one of the biggest upsets of the World Cup you expect to win. But Ronaldo decided to be Ronaldo. After the U.S. found themselves down 0-1 early, Jermaine Jones scored in the 64th minute to tie the match. After the U.S. failed to score on an empty-netter just minutes later, Clint Dempsey scored this go-ahead goal in the 81st minute. Portugal was stunned. We were now on the cusp of something incredible. With a huge upset win over Portugal we had already clinched a spot into the next round of the World Cup, regardless of the outcome of our next match with Germany. But again, Ronaldo decided to be Ronaldo. Time expired and the referees added 5 minutes to the clock to make up for stoppage time during regulation. In the final minute, Cristiano Ronaldo — arguably the best player in the world — booted a perfect pass across the field and off the head of Silvestre Varela to score the tying goal with just 35 seconds to play. This video out of Hattiesburg, Mississippi perfectly displays how the country felt following the goal. 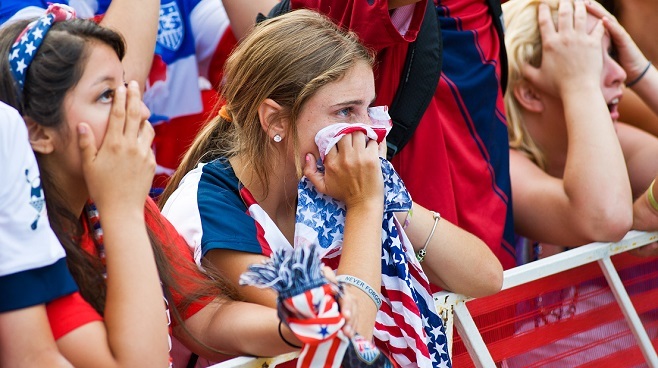 The USMNT now has to defeat or tie Germany Thursday to advance to the elimination round of the World Cup.